Is your business using Instagram? Want to learn how to be more creative with Instagram? By making the most of Instagram’s unique features, you can stand out from the crowd and leave a lasting impression with customers and fans. 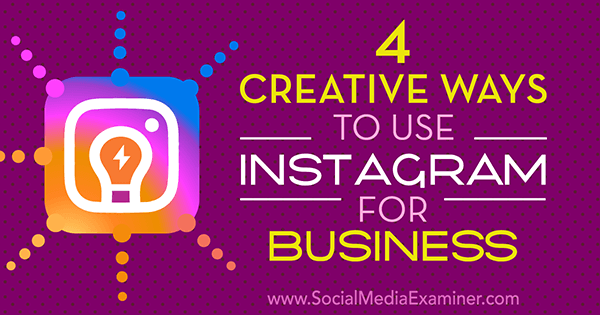 In this article, you’ll discover four creative Instagram accounts you can model in your own marketing. 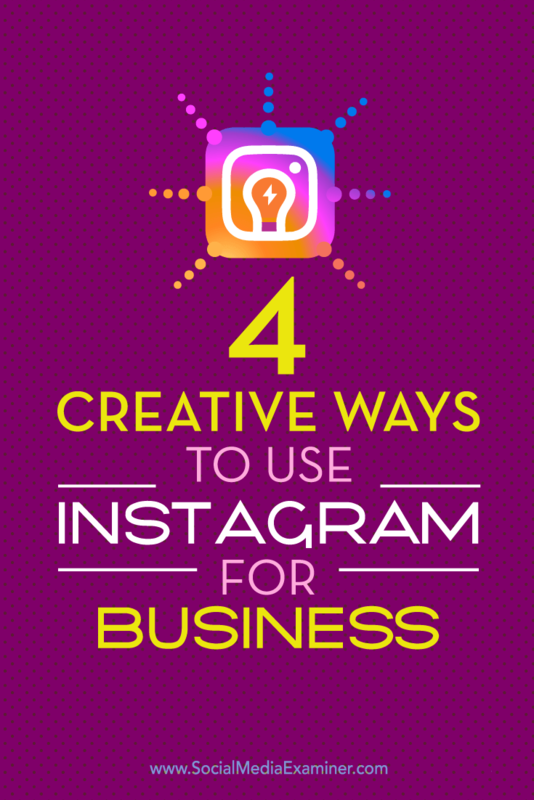 Discover four creative ways to use Instagram for your business. Want Instagram users to browse your products and make a purchase? 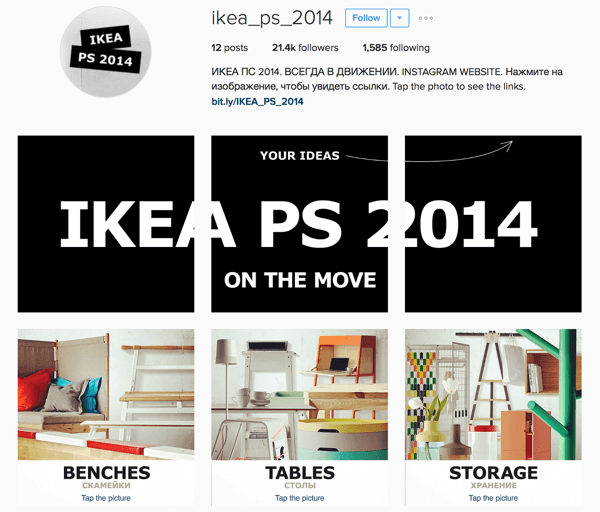 IKEA used Instagram to launch a fully functioning catalog-type “website” by using the platform’s tagging feature. The account works just like a regular Instagram account. Users browse through product images and are redirected to individual product accounts by tapping on the images. You can adapt this campaign strategy to your business with a bit of patience. First, make sure you have individual emails set up for each product category you want to feature. Use each email to create a corresponding individual Instagram account for each product category. Then load each category profile with images of individual products. Finally, make sure to feature a direct link to purchase for each individual product category account’s Bio section. Tag each product’s Instagram account. From there, use your main account to upload photos of multiple products and tag the relevant product’s Instagram account. Generosity goes a long way for a brand when paired with a strong social strategy. 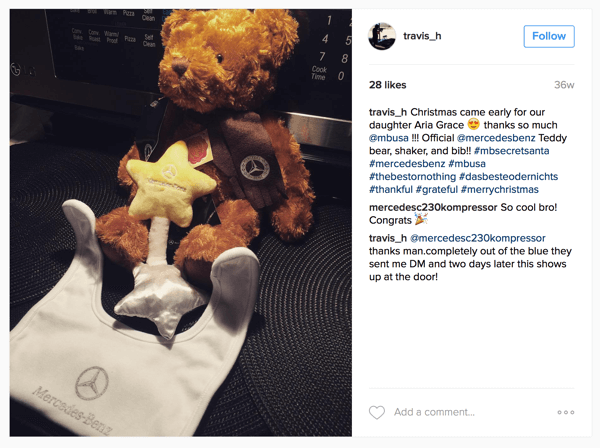 Armed with the hashtag #MBSecretSanta and generous intent, Mercedes-Benz combined comments and direct messages to give away 1,000 gifts to friends of their Instagram followers. 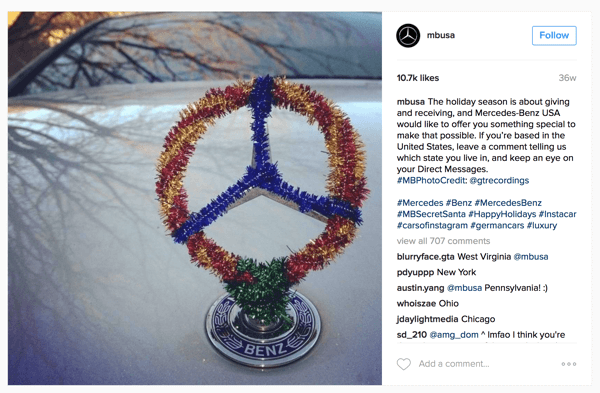 This allowed Mercedes to connect with their audience on a personal level, thus strengthening their relationship with existing and potential customers, and gaining visibility for their brand. You don’t necessarily need a large budget and 1,000 gifts at your disposal to easily adapt this campaign to fit your own business. If you’re a highly recognizable brand, you can offer unique branded items to dazzle your most passionate customers and prospects. If you’re a smaller company, you can opt for smaller, quirky items with a “cool factor” to make you memorable and drive brand equity. A surprised and delighted customer shares the good news with his peers. Once you decide what to offer, create an Instagram post and ask people to leave a comment if they want a chance to receive or give a gift. Then simply use Instagram’s Direct Message feature to contact the lucky recipients. Remember, the incentive is up to you; the important thing is that you’re connecting with your audience one on one! Instagram was built to tell visual stories, and Old Spice shows how strong storytelling can be. 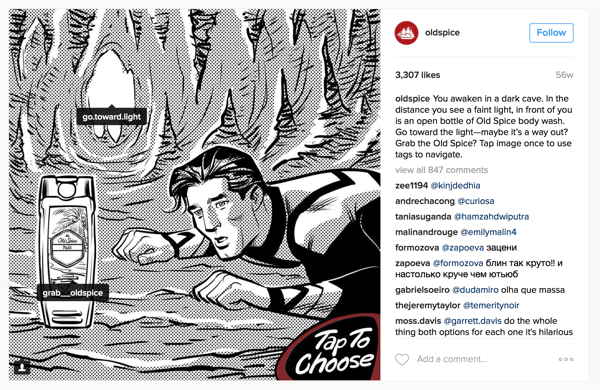 Using a technique similar to IKEA’s Instagram website catalog, Old Spice created a “choose your own adventure” narrative for users to navigate. The story was filled with monsters, robots, pop culture references, and all of the wacky Old Spice jokes you would (or rather, wouldn’t) have thought of. What would you do? Old Spice knows what they’re doing! To model this campaign in your own marketing, outline a relevant and engaging story to share with your audience. If you’re not looking to go to the lengths to create a “choose your own adventure” story, consider posting a tour of your local area that includes choices for historical sites. Make sure to include intriguing and appropriate images or videos to move your viewers through the adventure, and use tagging to present them with at least two choices in each image or video. As the adventure unfolds, lead viewers to another tagged image or video to deliver another set of navigation choices. It’s a great way to invite engagement and capture the ongoing interest of your audience. What would an Instagram article be without mentioning the foodie culture? If you scroll past all of the badly photographed food and duck-face selfies, you’ll see creative uses of the album layout. For example, Reynolds loads images of a seemingly endless dinner table, each section of which is themed after a specific holiday or season such as Thanksgiving, Halloween, and summer. Every “table” album holds 21 images of individual dishes, each with a description designed to drive traffic to their website. 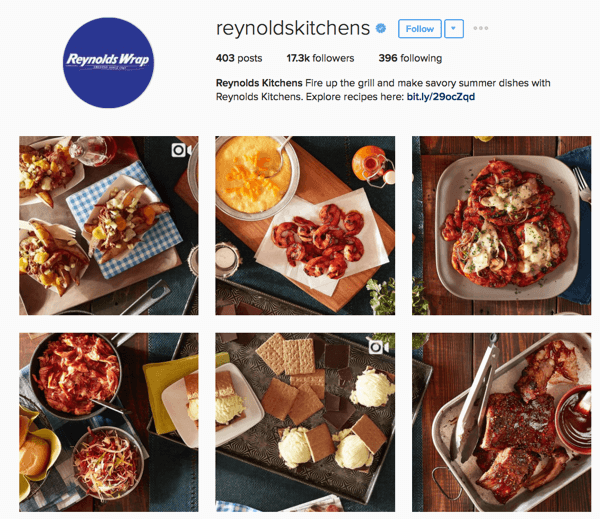 Reynolds’ account is seamless and a stunning feast for the eyes. To model this campaign in your own marketing, the most important aspect to remember is that you need to provide quality content that informs your audience. When you shoot your large-scale image, carefully place each product into a space you can easily crop into a square. Then load your square image set (one after the other in order) to create the illusion of a seamless, large-scale image on your Instagram profile page. Finally, add a description to each image that explores its value and shares some insight that will prompt viewers to visit your Bio section and click the link that redirects them to your website for the full story. As Instagram’s potential becomes more apparent, the number of brands jumping on board has increased exponentially recently. However, you shouldn’t let the increased competition stop you. As brands jostle for their audience’s attention on the platform, innovative marketers have accepted the challenge and succeeded. Their recipe for success? Thorough research, a spark of imagination, and a desire to make their brand stand out and leave a lasting impression. So what are you waiting for? Put your thinking caps on and connect with your audience! What do you think? How do these examples inspire you? Will you use any of these ideas in your own marketing? Share your thoughts in the comments below. 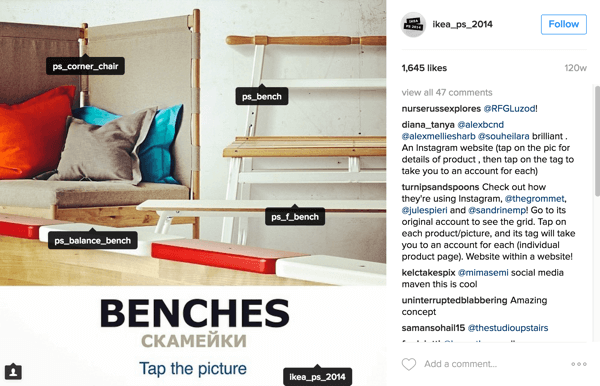 Tips on four unique ways to highlight your business on Instagram. Dorothy is a Digital Marketing Manager at Blue Polo Interactive and Social Sponsorship Manager at Influencer Connect. She has a passion for learning and sharing creative digital marketing strategies.